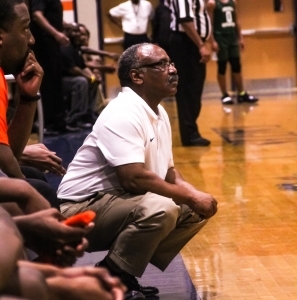 Hall of Fame high school basketball coach Dr. Phil McCrary moved into an exclusive club on Wednesday as his Columbia Eagles held on down the stretch for 56-47 win over the Arabia Mountain Rams giving McCrary his 600th career victory in the gym where he started at Columbia in 1988. His Eagles (14-9) held a 48-29 lead heading into the fourth quarter as Kenneth Hardaway score the final four points of the third period. But nine turnovers contributed to a 16-0 run by the Rams (6-19) who cut the lead to 48-45 with just 2:17 to play on a drive for a basket by Romero Head. Two quick turnovers by the Rams led to baskets by Liron Thomas and Solomon Holmes that broke up the run as well as pushing the lead out to 52-45 with just 55 seconds remaining. Holmes and Thomas would also both hit two free throws in the final 43 seconds and Miquel Shaw had a big block to keep the Rams in check. McCrary was congratulated by family, friends, former assistant coaches and players following the win as his record goes to 600-212 in 27 seasons as high head basketball coach. The win also put McCrary into the state playoffs for the third consecutive season since returning in 2017 and for the 16th time in his career including five state championships in 2006, 2008 and 2010-2012. The Eagles are also on a 16-year run in the state playoffs including four years (2013-2016) under Kerry Sandifer who replaced McCrary when he moved to the DCSD Athletics office before retiring. Devin Longstreet led the way for Columbia with 15 points with Thomas adding 13 and Shaw 10. 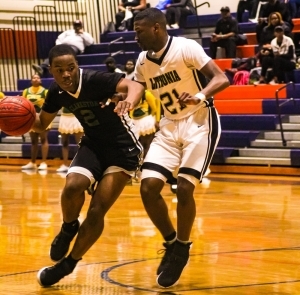 Arabia Mountain was led by Romero Head with 13, Brandon Gunn with 11 and Chase Ballard with 10. Columbia moves into he semifinals on Friday against No. 7 ranked Lithonia, a 59-44 winner over Clarkson, at 5:30 pm at Columbia. The Columbia Lady Eagles also punched their ticket into the state playoffs riding the back of 10 three-pointers to a 57-39 win in the night’s opening game at Columbia. A slow start and trailing 5-3 against Lithonia (7-16) Constance Thomas and India Terrell hit back-to-back three-pointers for the lead they would never relinquish. Daija Carr hit her second trey of the first period with seven seconds left for a 15-7 lead. The pair would hit threes again late in the half to send Columbia (19-6) into the half up 31-18. Carr would contribute two more threes in a 15-0 run in the third quarter that put Columbia up 49-24. N’Layia Perkins helped Lithonia put together a 12-0 run in the fourth quarter with three consecutive baskets as the lead shrunk to 54-39. Terrell hit three of five free throws in the 47 seconds to close out the game for Columbia. Perkins finished with 14 points and 11 rebounds to lead Lithonia and Jai’Jah Parker had 12 points. The No. 10 ranked Arabia Mountain Lady Rams rolled out to a 10-0 lead and never looked back in its girls’ quarterfinal 72-18 victory at Columbia. Senior Kennedi Manning led the way with 16 points as she went over 1,000 points for her career scoring with just under three minutes to play in the first half. Arabia would go on to lead 43-9 at the break. Arabia Mountain (18-4) advances to the tournament semifinals on Friday at 4:00 pm against Columbia. The No. 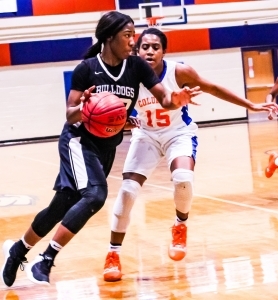 7 ranked Lithonia Bulldogs trailed by as much as 15-6 before rallying for a 59-44 win in the opening round game on Wednesday. Eric Gaines three-pointer with 38 seconds left in the first quarter pulled Lithonia within 13-17. Trailing 20-13 following a Bass three-pointer to open the second quarter. Lithonia answered with a 14-0 run led by N’Kyzie Hawkins nine points to make it a 27-20 game. Gaines (7 points) and Hawkins (six) extended the lead out to 48-34. Eric Gaines finished with 18 points to lead four Bulldogs in double figures in the game. Joining him in double figures were Justin Myles (13) and Hawkins (12). Other teams punching their tickets were the Tucker Tigers 55-31 over Forest Park in Region 4-6A. They were joined by the Martin Luther King Jr. Lady Lions (14-12) 44-27 over Mt. Zion. The Tucker Lady tigers (6-2) and the Stephenson Jaguars (12-13) both had their seasons come to an end. The Cedar Grove Saints moved into the Region 5-3A championship with a 51-41 win over Westminster. They face off with Pace Knights (17-7) on Friday.